Claire White, first professor of cognitive science of religion in North America. Photo by Lee Choo. Claire White always has been fascinated by the mind and what motivates individuals, so it’s no surprise she majored in psychology. However, her interest expanded as an undergraduate into multiple disciplines — neuroscience, anthropology and religion, and resulted in her earning a Ph.D. in the cognitive science of religion from Queen’s University in Ireland. Today, White, an assistant professor in California State University, Northridge’s Department of Religious Studies, is fulfilling her interdisciplinary interest as the first-ever professorship in the cognitive science of religion in North America. White said the cognitive science of religion is a relatively new approach to the study of religion. It began in the 1990s with a handful of scholars who were concerned about the lack of the role of the mind in theories of religion and the lack of experimental/empirical research and explanations of religion, methods common to the sciences. “They asked, if religion is part of culture, why can’t we study religion in the same way that the sciences have studied cultural phenomena?” White said. She said the main goal of the discipline is to understand and explain the role of the human mind in acquiring, transmitting and spreading religious ideas and behavior, and to use methods from the sciences, in conjunction with methods that are more traditionally humanistic, to explain why certain forms of religious ideas and behaviors are cross-culturally recurrent. While many institutions around the world now offer graduate-level education in this area, CSUN is making history as the first to offer courses to undergraduate students. 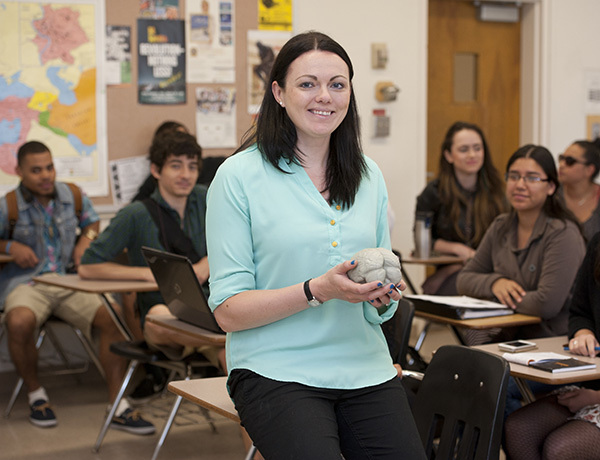 White, a native of Ireland who previously worked at Queen’s University in Ireland, King’s College and the universities of Oxford and Cambridge in London, said her teaching approach encourages students to use cognitive science to complement their areas of interest. She adopts an interdisciplinary approach to religion, using the approaches of the evolutionary and cognitive sciences to understand human thought and behavior, especially folk concepts of personal continuity and representations of the afterlife. The field employs methods and theories from a very broad range of disciplines, including: cognitive psychology, evolutionary psychology, cognitive anthropology, artificial intelligence, cognitive neuroscience, neurobiology, zoology and ethology.